Diatomaceous earth is used as a filter aid for the clarification of turbid beverages. The risk when using diatomaceous earth has been known for a long time. Breathable dust from diatomaceous earth is highly dangerous to health and may cause silicosis and lung cancer. Specifically, the crystalline silica (Cristobalite) in the diatomaceous earth is very critical. In 1998, the crystalline silica was completely re-evaluated by an international committee and upgraded to the highest category of risks. There was a proven significant risk of mortality from cancer, so it is now classified in the first risk group, defined as "serious carcinogenic effects on human beings". This decision has a crucial effect on the personal protection of employees and legal consequences. It is no longer allowable to handle diatomaceous earth without any protection. Dust, as it occurs when pouring a bag, must absolutely be avoided. The solution is very simple: instead of pouring the diatomaceous earth onto the surface, it is inducted directly into the liquid using an Ystral-TDS induction mixer! The TDS-induction mixer – while it mixes the liquid – produces a vacuum in its mixing head. This vacuum is used to induct the powder into the liquid directly under the liquid surface. Neither lifting bags nor pouring powder is required anymore. The powder is inducted directly from the bag using an induction tube and an induction hose. The immediate wetting of the powder occurs in the mixing head below the surface of the liquid. No dust comes out from the surface of the liquid. No dust exhaust system on top of the vessel required. During the induction of the powder out of a bag using the induction tube an air flow occurs from the outside into the bag. For this reason no dust comes out of the bag during the induction. The bags are emptied complete and clean. If just a partial amount of the powder is required, the bag may be placed on a scale and only the required amount of powder is inducted. The TDS-induction mixer is a special version of the Jetstream mixer. The jet stream principle is suitable especially for diatomaceous earth suspensions as they are known for their strong sedimentation. Depending on the volume of the vessel, different sizes of machines are offered. The induction rate reaches up to 20 kg/min (40 lb/min). But even more is possible with the TDS-induction mixer: with a CO2-connection, the same machine may be used for the substitution of Oxygen by CO2 in the liquid. TDS-machines allow an almost dust-free handling of powders. The risk for the operator is reduced to a minimum. In the magazine "Diatomaceous earth" of the Employer's Liability Insurance Association for food industry in Germany the TDS induction mixer is recommended for that reason. The investment for a TDS induction mixer is really very low compared to the installation of a dust exhaust system or the consequences of an inadmissible handling of the powder (serious damages to someone's health, legal disputes etc). By the way: The TDS-induction mixer is suitable for the induction of Activated Carbon as well! 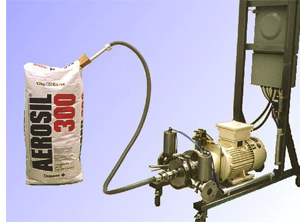 Jetstream mixers are known for their vertical mixing principle. Different to conventional stirrers they provide an effective mixing and homogenous suspension. The mixing head creates a strong stream, directed to the bottom of the vessel. On the bottom of the vessel, the stream is separated and redirected to the surface of the liquid. Because of this stream the contents of the vessel is completely mixed in a vertical manner. For this reason one of the main fields of application is the mixing of all products which require a good homogeneity of any kind of small or large vessels. Jetstream mixers are available for top entry, bottom entry or side entry installation. Large tanks with raw milk for example can be mixed with rather small machines. The Multipurpose machine is a version with interchangeable tools. A coupling allows a quick exchange of the mixing shaft. The machine may be used as gentle mixer, as a Dispermix for fast dissolving of thickeners, as an intensive disperser or as an emulsifying machine. Very often the multipurpose machine is attached to a moveable lifting column. That's way it can be used in barrels and containers. Beverages always contain components with different densities or structures. To avoid creaming, sedimentation of floating particles or modification of the structure, very often Hydrocolloids are used as stabilizers. These Hydrocolloids generally are highly active thickeners, designed for the particular application. They are available as powders and because of their thickening effect, they are only applied in very small concentrations. Because of their special properties they are always difficult to handle. Very often they are dusty, sticky and they form lumps and agglomerates, which again have the tendency to stick to the wall of the vessel or to the mixing tools. They are difficult to mix in and float on top of the surface of the liquid. If high mixing energy is used to pull them downwards from the surface of the liquid, then air is always poured into the liquid via the resulting Vortex. Ystral offers two different systems that avoid these problems. The Conti-TDS (pictured on left) is a machine, which is installed outside of the vessel - similar to a pump. The powder is inducted from a bag, funnel or container and immediately dispersed. The machine may be connected to one or more vessels. Even for the additional dosing of stabilizers into ready-made products, the machine provides a perfect decomposition and a homogenous distribution in large vessels. The machine itself builds up the required vacuum, no additional conveyor or vacuum vessel is required. No additional pump is necessary to transport the liquid. Of course the machine can be used to induct other powder materials, fruit pulp or liquid components as well. With the Daitec-Conti-TDS shown on the left side for example, six bags of skimmed milk powder may be inducted in just one minute. A completely different method of stabilizing beverages is the incorporation of Bentonite for clarification or the absorption of proteins. With the Conti-TDS Bentonite may be inducted and dispersed directly into the fruit juice. Alternatively to the Conti-TDS, a Dispermix (pictured on right), a combination of Jetstream mixer and disperser, is available for the installation inside a vessel. This machine has the capability to break down agglomerates very quickly in its dispersing zone and simultaneously homogenize the complete contents of the vessel. As the machine has no open stirring shaft, no vortex builds up and no false air is incorporated into the product. Beverage emulsions are high-grade dispersions with a very narrow and very low drop size distribution. During storage they should not start to cream or sediment and they have to provide a stable turbidity. For these emulsions, very often extremely expensive high-pressure homogenizers are used. Inline-dispersing machines from Ystral (pictured on left) fulfill the required specifications for just a tenth of the normally required investments. They are very effective, service friendly and simple in their construction. Many users have confirmed that 95% of all beverage emulsions can be produced with our Inline dispersing machines. The Inline disperser can also disperse and homogenize fruit flesh and pulp. For the production of spray dried beverage concentrates, very homogenous and finely dispersed emulsions and solutions have to be transferred into a user-friendly powdery form. Therefore some carrier materials such as Maltodextrine, Arabic gum and emulsifying starches are mixed into the spray emulsion. The Conti-TDS is able to induct and disperse all these powders and the aromatic oils as well. The product is dispersed to the required droplet size without using a high pressure homogenizer. A maximum concentration of solid materials is possible - this maximizes the performance of the spraying process. Glazes, engobes and cast products very easily may be homogeneously treated with the YSTRAL- Jetstream mixer. The Jetstream mixer works with a fixed stator ring and a rotor rotating inside the stator ring. The liquid stream is directed towards the bottom of the vessel and completely suspends all sedimentation on the bottom of the vessel. The vertical mixing principle does not allow the building up of a Vortex and the incorporation of air is safely avoided. As no seal or bearing is installed in the submersed part of the mixer, a long life/time of the machine is guaranteed. The execution in stainless steel V4A allows easy cleaning by simply submersing the mixer into water. Additional technical information, such as variable speed setting, barrel clamping system, shaft extension and large machines upon request. This machine has been designed specifically for applications in the dairy and food products industry. Its advantage is the new Hygienic Design and a powder-adding-table with an integrated funnel in an ergonomic working height. Because of the high induction vacuum, the machine can be used to induct powders from any powder container using the separately attached induction tube. This is suitable for very dusty powders that cannot be poured into the funnel from a bag or for inducting large volumes, directly from Bulk Bags, containers or - via a weighing system - from barrels. It is possible to induct liquids directly from a barrel as well. The mixing table is not combined with the machine itself and therefore it may also be installed on the right or left side of the machine and makes it more easy to clean the system. The handling is very simple: neither powder nor liquid valves have to be adjusted over and over again for a proper operation. The machine is offered in four different sizes with a power from 11 to 22 kW. Only one drive is required and is always operated with a frequency converter. This allows a flexible setting of the speed to fit to the individual process. The machine may be cleaned by CIP and - due to the simple clamping system - is easy to disassemble and is easy to re-install absolutely tension free. In the Chemical Industry, as well as in the Pharmaceutical and Cosmetics Industry, emulsifying in a batch process is a significant processing step. Problems in the production phase will follow the product if the incorrect or inappropriate mixing equipment is selected. Emulsions are based on liquids that, under normal conditions, are not easy to be mixed together to a homogeneous state. The physical basis for this behavior on one hand is the different density, and on the other hand the electro-chemical properties of the liquids involved. Only when using mechanical energy in form of shear energy and an emulsifier, is it possible to homogeneously combine two or more immiscible liquids to an inseparable mixture, a stable emulsion. Processing of emulsions is basically a two-step production, a mechanical part and an electrochemical part. In the mechanical part, the product is dispersed into very small droplets. This is done with shear energy that is applied to the mixture. Without the adding of an emulsifier, these small droplets would immediately recombine, slowly increase in size and soon float as a separated large bubble in the vessel. The electro-chemical part is adding the emulsifier as quick as possible and in dosed quantities to come into contact with the small droplets. The aim of this step is to coat the surface of the dispersed droplets with the correct amount of emulsifier to change the electrical load of the so-called "Micell" to avoid the attraction of other "Micells". The main effect of the coating of the droplets is the repulsion of the droplets to each other inside the surrounding continuous phase. A separation of the disperse phase and recombination of the droplets is not possible anymore. The energy applied in this phase is very low, and not sufficient for the emulsifier to inhibit larger droplets from coalescing. Processing aim is to produce a large number of very small droplets with the respective large surface. Generally during an emulsifying process, a pre-emulsion is produced in a batch and then additional "emulsifying" or "homogenizing" is applied. The pre-emulsion is the ready-made mixture of a continuous and a disperse phase and the added emulsifier., Standard or conventional stirrers that are used are not able to get the required droplet size because of the low shear energy . Conventional stirrers in many cases are oriented radially and not axially and there is an uneven mix of the two phases from top to bottom of the vessel combined with increasing or decreasing droplet size towards the surface of the mixture. Because of the rotation of the liquid in the vessel, like in a centrifuge, large particles are accelerated to the outside of the vessel while light particles remain at the inside. It is obvious that such a pre-emulsion will result in an unsatisfactory additional emulsifying process. Further processing steps and machines, such as the Inline dispersing machine, that are continuously supplied with product from the outlet of the vessel, are able to treat continuously changing concentrations and droplet sizes. 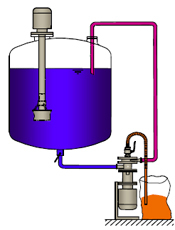 It is mandatory for a homogeneous and reproducible batch emulsifying process that a perfect mix of the contents in the vessel happens, in combination with a system that applies sufficient shear energy to delay the dispersed droplets from recombining until the emulsifier has coated their surface. The Dispermix system is specifically designed for emulsifying in a batch or the production of a pre-emulsion, and has many advantages compared to other conventional systems. The basis of the system is the Jetstream mixer with a rotor-stator system combined with a batch shear ring machine. The design of the head is equal to the Jetstream mixing head that uses most of the applied energy to create a vertical flow of the liquid in the vessel different to other stirring or mixing principles. Additionally the Dispermix mixer creates the maximum speed in its center and not at the edges of the blade and as such absolutely suspends any sedimentation in the bottom of the tank and it also increases the heat transfer with the wall of the tank. The slots in this head and the defined radial gap (distance of the rotor from the head) provide much higher shear energy compared to the normal Jetstream mixer or other stirring elements. The shear gradient (quotient of peripheral speed of the rotor and gap) in this case is much larger, and this again results in a smaller droplet spectrum. The emulsifier can be added directly into the head of the emulsifying system and thus to the area where the small droplets are created. This ensures that the coalescence is as short as possible and most of the small droplets are immediately coated with the emulsifier. In many cases an additional processing step with an inline dispersing system is no longer required as the quality of the emulsion after this step is already satisfactory. With this type of dispersing system the whole contents of the vessel is homogeneously mixed. From start to the end of the pre-emulsifying process, it is guaranteed even during emptying of the vessel that a homogeneous pre-emulsion is fed to the additional processing step. The Dispermix replaces the very often used combination of a batch dispersing machine and stirrer and this results in lower purchasing cost and simple processing controls. 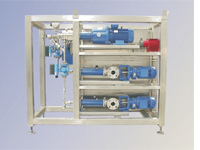 The system may be used in low to medium viscosity products without any additional form of mixer. Where high viscosity products have to be treated, then the dispersing mixer may be combined with a wall scraper that feeds the product directly into the dispersing and mixing head. As well as the emulsifier, often stabilizers are used to adjust the texture characteristics of products in the food industry. These products also interact with the electrochemical effect as they form a kind of ion layer around the particle droplet and reduce the immobility of the complex mixture due to its size and load. In extreme cases, the system comes to a complete standstill. Stabilizers in many cases are supplied in powder form, and a loss of powder can be suffered during addition into the liquid. Many of these powders become sticky when they come in contact with a liquid and these stick to the wall or the mixing shaft in the form of big lumps or crusts. As a result, filter systems are required to remove these impurities. The problem when adding such powders is that after adding it to the surface, a large quantity of agglomerated lumps are formed that, compared to the liquid, have a lower density and for this reason float on the surface (CMC, Xanthan, Pectin, etc...). With radial acting stirrers it is very difficult to force these agglomerates and lumps from the surface into the liquid, and long treatment time is the result. In such cases these stirrers are operated at highest speed to achieve a Vortex to draw the powder into the liquid, but this also incorporates unwanted air as well. This air causes oxidation and as such an uncontrollable change in the quality. The Dispermix does not cause a Vortex and as such eliminates the problems described above. Powdery raw materials are used in almost every product in the lacquer and paint industry, in all sealing compounds, adhesives, and construction chemicals. They are being used as fillers, thickeners, matting agents, conserving agents, improvement for adhesion, anti suspending or thixotropic additives and many others - and last but not least as pigments. The Ystral-Conti-TDS is used to induct and disperse powdery materials and is much more effective and cleaner than a dissolver or stirrer would ever be. It works according to the principle of a shear ring dispersing machine and builds up a strong induction vacuum directly in the zone with the highest shear rate. This vacuum is being used to induct the powdery materials loss-free directly into the high-shear zone where they are immediately and completely wetted and dispersed. 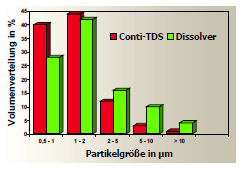 When comparing between the dispersing effects of the Conti-TDS with conventional systems, astonishing results are seen. The most important parameter to describe the dispersing effect is the shear gradient - the quotient of shear speed and gap between rotor and stator. A stirrer generally only offers a shear gradient of about 20 s-1, a dissolver calculates to about 50 s-1, the Conti-TDS on the other hand results in a value for the shear gradient of 50,000 s-1, and as such is thousands times higher than a dissolver. The processing aim during powder adding and pigmenting of lacquers, dispersion paints and coatings is the complete wetting, deagglomeration and homogeneous distribution of the solid contents (e.g. pigments) in the film forming solution or dispersion. This process consists of the following steps: vessel emptying, powder transport, powder incorporation, wetting and dispersing. When using a Conti-TDS, all these five partial processes are done with one machine only. This does not only shorten the whole process, it also results in a reduction of manufacturing cost (TDS = Transport- and Dispersing-System). Dosing of pigments and wetting in conventional processes are always affiliated with the forming of dust. One of the main arguments for the TDS-principle is the dust-free operation. Pollution of the working area as well as endangerment of personnel is avoided. The induction vacuum is not produced by an external vacuum pump or a vacuum transporting system but inside of the wetting liquid itself. The full amount of powder is inducted into the liquid, without any loss. The induction vacuum causes the drum or bag emptying, the powder transport and the powder incorporation. Additional transporting means and systems for dust exhaust are not required. All costs for the purchase, the operation, maintenance and monitoring of exhaust systems are omitted. The disposal of filter remnants and filters is omitted. No dust is formed on top of the surface of the liquid. No partially wetted agglomerates build up in the liquid as with a dissolver or a stirrer. The well known powder crusts that build up on the wall of the vessel, cover and mixing shaft that fall off in a dissolver vessel and such reduce the quality of the final product definitively do not occur when using a Conti-TDS system. The quality of a product in any situation can be improved when using a Conti-TDS. Agglomerates and lumps do not build up. Powder incorporation into open vessels with a dissolver or a stirrer is extremely dangerous. It is well known that not the solvent containing liquid is inflammable but the solvent containing vapor on top of the liquid. Powder – this is very often forgotten – always contains oxygen. Powder that is poured may electrically load up and produce an ignition spark. To ignite solvent containing vapor, a very small spark with minimum ignition energy is sufficient. When using a Conti-TDS the powder is no longer poured into the vessel with the solvent containing vapor but into the circulating liquid. With the induction vacuum, the powder is directly inducted into the liquid. Because of the induction effect no solvent containing vapor builds up. Conti-TDS-machines of course are certified by ATEX. The selection of a suitable wetting and dispersing method has a remarkable influence on the quality criteria such as stability during storage, optical characteristics, resistance to the weather and last but not least, the brightening and coverage ability of lacquer systems and paint. Powders provide a very high specific surface area. For ultra fine pigments and high disperse silicic acid this can be over 300.000 m² per kg of powder. If you realize that for conventional powder incorporation from top into the vessel, not only one but many kilograms of powder fall onto the surface of only a few sq/m then it becomes clear that because of the difference between liquid and powder surface only agglomerates are partially wetted. The Conti-TDS immediately provides a fine distribution of the powder directly within the wetting area. In the shear field, in between the fast running rotor and the stator, the wetting surface of the liquid is set to an equivalent volume of powder. The maximum dispersing effect immediately during the wetting process does not only reduce the treatment time, it also results in a much better properties of the product compared to conventional powder incorporation. A lack of shear energy later on in the process cannot be fixed at that time, not even by an extended dispersing time. For this reason the shear energy in the first phase of the wetting must be as large as possible. It has to be stated that some products of course do not need a strong dispersion or may be over-sheared (e.g., dissolving of granulated resin into solvent, induction of shear sensitive effect pigments or similar). For such cases, the stator of the machine simply may be removed without any problem. The wetting is then effected by the Conti-TDS under vacuum but without any remarkable shear. Conti-TDS-machines are offered in five different sizes with a power range of 7,5 to 150 kW. Depending on the application they can be equipped with a variety of powder inlets or dispersing tools. In the low to medium range of viscosity the machines transport the liquid by itself. Only when inducting into high viscosity media, such as adhesives, knifing filler, offset printing ink and seal compound or similar an additional volumetric pump must be switched in line at the outlet of the machine. For the production of low viscosity products, such as lacquers and paint, it is absolute nonsense to adjust the viscosity to a high value for the incorporation of the powder. The viscosity of the liquid has a main influence on the wetting and dispersing effect. Liquids with a low viscosity of course have a better and much faster capability to wet powders than a high viscosity liquid. A dissolver process on the other hand requires a high viscosity. A high viscosity is mandatory that a shear effect builds up in the product and that the product does not splash out of the vessel because of the high speed of a dissolver disc. This high viscosity is not optimal for the powder wetting effect. Agglomerates build up – this is unavoidable – and the energy of the machine is wasted to again break the agglomerates as much as possible. The use of the Conti-TDS in this application is completely different. The shear gradient of the Conti-TDS is a thousand times higher compared to the shear gradient of a dissolver disc. For this reason, the Conti-TDS does not depend on a high viscosity to build up a comparable dispersing effect. The dispersing step for this reason with the aim of a complete wetting may be executed in the low viscosity range. In the low viscosity range the speed of the powder induction also achieves a higher value. The performance of the Conti-TDS is not related to the size of the vessel and the filling level, a combination with small as well as with large vessels is absolutely no problem. If the vessel is equipped with a Jetstream mixer, installed close to the bottom of the vessel, then variable volumes may be produced (Pic. 8). Similar to an Inline dispersing machine, the Conti-TDS is installed outside the vessel and connected to the vessel using a piping system or flexible hoses. The machine works independent from the size of the vessel or the filling level. The machine may be operated either in a horizontal or a vertical position and the flange connections may easily be adapted to the on site situation. Sometimes, a machine on casters for transportation is used in the paint and lacquer industry to use it in several places. The place of installation of the CONTI-TDS may be selected in such a manner that the effort for transporting the powder may be reduced to a minimum. Lifting of bags to the platform of the vessel is omitted. All TDS-machines create the induction vacuum directly in the liquid stream. This induction vacuum is used to induct the powder directly from bags, silo, BigBag or containers into the liquid. The powder is immediately wetted and dispersed. Powders and liquid reach the mixing chamber on completely separated ways and only come in contact with each other in the dispersing zone. There the mixture is dispersed with high shear energy and vacuum. This allows the production of solid concentrations that can never be achieved with stirrers or dissolvers. Another important aspect is the optimized and always constant powder induction rate, independent from the influence of the operator. This problem is well known for dissolvers: one operator carefully pours the powder very slowly directly into the Vortex of the dissolver, another pours complete bag into the vessel. The dispersing results at the end of the process are completely different and may not be corrected, even with a lot of time and dispersing energy. The quality of the end product varies a lot. Very often we encounter processes where thick film glazes before filling have to "ripen" for eight hours, as controlled powder incorporation could not be achieved. The viscosity develops uncontrolled and the end product must be diluted or the viscosity has to be "re-adjusted" before it is filled. Similar problems arise in the adhesive industry. With the use of a Conti-TDS, these problems are eliminated. The machine inducts exactly the amount of powder as it can wet optimally. The quality of the end product is constant. When the powder induction is finished, the powder inlet is closed. The product is then additionally dispersed in a loop until the optimal particle size, required matting degree or consistency is reached. In this phase, the machine works as a shear ring dispersing machine with a high pumping rate and many passages through the High Shear zone. Of course the TDS-principle is not restricted to powder induction, the same machines may as well be used for the induction and dispersing of liquids. This is especially of interest, when in the production of thick layer glaze, high viscosity gels have to be mixed into a low viscosity basic liquid. In vessels equipped with stirrers or dissolvers homogenous mixing is not possible. When using a Conti-TDS, the high viscosity gel is inducted inline into the basic liquid and reaches the vessel already completely homogenously distributed. Similar arguments apply to the incorporation of low viscosity additives or any other liquid in high viscosity dispersion paints or pastes. In vessels with stirrers or dissolvers, low viscosity liquids stay on top of the high viscosity basic liquid very long and are not mixed with each other. The Conti-TDS in this case also provides homogenous incorporation into the circulating liquid. Besides the induction of pigments or fillers, thixotroping is one of the most important fields of applications for the Conti-TDS, in case very dusty and high disperse silicic acid has to be inducted into the liquid. Common procedure is pouring the powder onto the surface of the liquid. Additional to well known problems such as dust, adherence and agglomerates during wetting in solvent containing systems in this case the silicic acid stayed in the solvent containing atmosphere and had enough time to bind the vapor of solvent. This tremendously and uncontrollably reduces the thixotroping effect in the lacquer. Using a Conti-TDS, the induction is effected dust and loss free. (Pic. 3) This already is an enormous advantage. The powder is inducted directly into the liquid and is not exposed to the vapor of solvent. It is completely available for the building up of the structured viscosity in the lacquer. Matting agents are used to adjust the degree of brightness of a lacquer. The problems using a dissolver are well known: during the powder incorporation agglomerates are formed. If these are dispersed for a long time, the matting effect is destroyed, if dispersing is too short, the agglomerates are not yet destroyed. Applied to black leather surfaces or furniture, the result is fatal. The Conti-TDS features an agglomerate-free powder induction and an extremely narrow particle size distribution during dispersing. This allows precise and repeatable and accurate matting. The most extreme reduction in time seen is the use of a Conti-TDS for the dissolving of resin and granulated resin. Wetting and dissolving times of a few seconds per bag are common. In the conventional dissolving process the powder is poured onto the surface of the liquid solvent. Partially wetted powder lumps and agglomerates are formed that require a long stirring time to be dissolved. Using a Conti-TDS results in an immediate and complete wetting of each powder particle. In one case for the induction of PMMA into MMA with a Conti-TDS after 3 minutes the same result was achieved compared to a conventional method with 6 - 8 hours of dissolving time. The production of low viscosity printing ink and dispersion paints is the field of application with the maximum effect. In the shortest possible time, large amounts of powders have to be inducted into a basic liquid and dispersed to a constant quality. Powder induction rates up to 450 kg/min for Calcium carbonate or 200 kg/min for Titanium dioxide are achievable. Systems are in operation where a Conti-TDS is installed in-between three 50 m³ storage vessels and one single operator produces batches from 10 to 70 tons with a quality that could never be reached before. In the field of automobile lacquers, building paints, industrial lacquers and wood lacquers, the flexibility and a universal usability of the system is the main reason to use a Conti. By simply changing the dispersing tool, metallic effect pigments can be treated with the same machine. For the production of coil-coatings and plastisols, another use is of interest: the controlled temperature incorporation. The processes have to be carried out with low temperatures. Different to a dissolver, with a Conti-TDS there is absolutely no increase in temperature during the process. When producing high quality paper coating paste, highest concentrations can be reached with the lowest possible amount of dispersing agent. When producing parquet lacquers, over-dispersing of the anti foam is eliminated. A lot of applications can be found in the building industry: from concrete additives to adhesive material for tiles where the Conti-TDS offers advantages that can't be provided by conventional mixing principles. In the book "Lackherstellung" (Production of Lacquers) by Dr. Friedrich Vock (Verlag CC Press AG) some old processes are no longer in use in the lacquer industry, such as the preparation of already sufficient fine and coarse particles, from soft and hard pigments and many others. 500 pages of experience are compressed in the section "Layout-Konzepte für neue Lackfabriken" (Layout concepts for lacquer manufacturing). It is obvious: modern manufacturers of lacquers do not possess a single dissolver. Powder induction as well as micro homogenizing is exclusively carried out with inline dispersers. (Conti-TDS). The macro homogenizing is carried out in a vessel installed on weighing cells and a mixer, which can handle different filling levels (in our case a Jetstream mixer). The dosing of the liquid components is not fed directly into the vessel but through the inlet of the Conti-TDS. Powdery components are directly dispersed into the liquid from a Bulk Bag, a container or bags, liquid components are dispersed from a barrel. The advantages of this "dispersing modus" have been proved for the complete pallet of semi products up to the production of paste. Depending on the requirement, the process is completed by a filter or mills. Ten years ago, the introduction of the Conti-TDS for the induction of Titanium Dioxide in the production of nylon or polyester fibers caused a complete modification of the production philosophy. Companies that do not use the Conti-TDS principle in this field are not competitive anymore. Diatomaceous earth (Kieselgur) is a filter aid used for the filtration and clarification of beverages. The exposure of diatomaceous earth containing dust is very critical and endangers health. Calcined diatomaceous earth contains crystalline silica which is a known cause of silicosis, a progressive, sometimes fatal lung disease. Since 1998 it is classified as carcinogenic to humans in the highest category (IARC group 1). Permissible exposure limits lie in different countries between 0,05 and 0,4 mg/m³. Pouring bags into a vessel creates dust and cannot be accepted anymore! The TDS Induction Mixer inducts diatomaceous earth dust free directly from the bag into the liquid! No dumping or pouring them! No dust extraction is required! Suspensions of diatomaceous earth always tend to sediment. No normal stirrer or agitator is able to keep this suspension really homogeneous - this is only possible using a Jetstream Mixer. The mixture takes place very carefully and does not change the characteristics of this shear sensitive suspension. With the same machine it is even possible to aspirate CO2 for oxygen substitution highly effective. Depending upon the batch size different machine sizes are available. The induction speed ranges up to 20 kg/min. Hanspeter Seeger, Günther Riedle Washing active substances (SLES) are mainly used in shampoos and liquid detergents. SLES is being delivered with a concentration of about 70% and has to be diluted to a concentration of about 28% prior to further treatment and adding of components. The dilution may be executed in a batch or with a continuous system. SLES is always added to the water, never the other way around. Independent from the high viscosity, SLES can easily be pumped and sheared. A continuous dilution using an Inline system avoids all these problems and may be realized with a Ystral SLES dilution system. The system can produce SLES dilutions, emulsions and suspensions and any other products with up to three different liquid components where an intensive mixing or dispersing is required. The Main component of the system is a three stage Inline dispersing and homogenizing machine. In addition to the normal axial inlet, this machine is equipped with two or three additional radial inlets directly into the dispersing chambers for additional dosing of components. The watery phase concentrically comes into the dispersing chamber, and through the radial inlets SLES and preservative liquid are added. When producing emulsions, the disperse phase and the emulsifier is dosed through the radial connections while the continuous phase is added concentrically through the axial inlet. The system is operated and controlled by a switchboard with integrated SPS. The three-stage homogenizing machine and the dosing pumps are controlled by a frequency converter, the flow rate is monitored by flow meters. All components - including a switchboard with stainless steel housing - are assembled into a stainless steel frame and may be installed in any place. If required, the system may be equipped with casters to be moved around. The main requirement for system design was easy cleaning. The system may be cleaned by CIP and may be steam-cleaned as well. The series offers systems with a nominal capacity from 1,000 kg to 18,000 kg per hour of ready product.